Sound of the Earth by Chen Sai Hua Kuan (Singapore) is an experimental sound installation that uses the power stored in wet soil to produce sound. The artist made use of a technique for collecting electricity commonly known as an Earth battery. 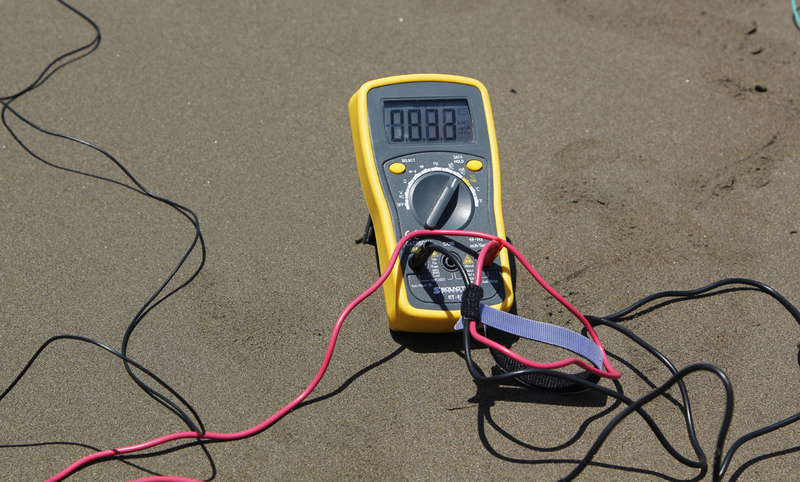 The basic idea consists of using pairs of electrodes made of different metals to collect the small Telluric electrical currents that can be found when the electrodes are buried in soil. Chen Sai Hua Kuan started these experiments in the cities of Padang and Banda Aceh in Indonesia, both of which sit in a region exposed to earthquakes and tsunamis. For this installation, the artist extracted soil from Seletar in northeastern Singapore. 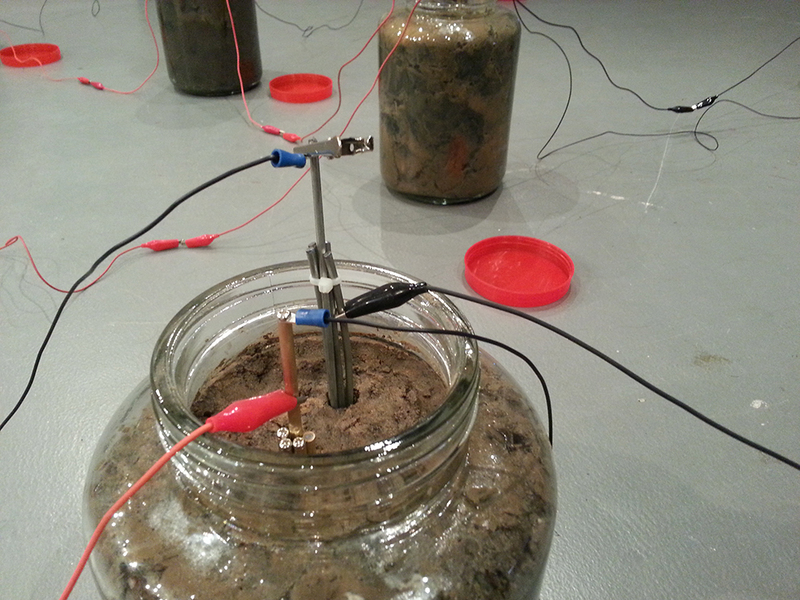 The soil was placed in an array of glass bottles and used to produce sufficient electricity to vibrate two small metal plates against each other. The impact of the metal plates creates a small hammering sound against clay bowls made from the same soil and fired in a kiln. The fired clay shapes amplify the small hammering sounds powered by the Earth battery array. SHK: I spoke to one of the scientists for quite a bit, about what was in my mind as an artist and what was in his mind as a scientist. I think it’s really similar, because we have the same school of thought, and that is to keep searching for an answer to satisfy our curiosity and understand what’s happening. It’s always the ideas that bring the artists forward, but a lot of the time, it is just bouncing ideas off each other. SHK: Basically everything: how the Earth moves, the lunar eclipse, tides rising because of gravity. The North-South pole of electric rods are the way they are because of the electrical charge under the earth itself. I started researching and this is what guided me along the way. A lot of components of my projects are based on science. SHK: I haven’t thought about it. I think I will leave that to the viewers. My project is an expression of myself, so I won’t tell the viewers what they should think, because everyone is different. SHK: I think I will let people make that decision: if it inspires them, great, if it doesn’t, great. There is only a small pool of people who understand science, and there will be a huge pool of people who will understand art. So if people think that it can inspire them or help them along the way, then it’s great! If not, just enjoy the show. That’s how I feel about art and science. For me, there is no big statement that I want to put across to my audience. This sound installation is borne out of curiosity rather than a desire to make a statement about something in particular. Chen Sai Hua Kuan is a Singaporean artist who graduated from Lasalle-SIA College of The Arts with a diploma in Fine Arts. Later, he went on to pursue a Master in Fine Arts from Slade School of Fine Arts, University College London. Throughout his career as a multi-disciplinary artist, Sai has extensively exhibited his works in Singapore, Japan, Canada, United Kingdom, and Germany. Sai has also won several awards and residencies. Additionally, he has also lectured and participated in workshops overseas.